If you are feeling stuck or overwhelmed, ask yourself: What do I need to place within the protective arms of Cancer? What am I nurturing through these challenging times? How might I honor the process? I renew my intention for this lunar cycle as I invite water to teach me how to nurture our interconnections and be nurtured by them. July 9—Full Moon: Blossoming. During this Cancer lunar cycle I’ve been thinking how emotions are teachers. I’ve been wondering if my feelings can help me recover awareness of interconnection and interdependence—something research tells us is crucial for human survival. This Cancer lunar cycle has created a space to be held in our emotions. That image sounds lovely, comforting, supportive. But that may not be your experience of this lunar cycle so far. Cancer is holding this space to feel what we feel, but it might take everything we’ve got to stay in that space. Emotions are messy and they definitely hurt sometimes. I know I have stepped in and out. Feelings are arising but I’m not always comfortable with them. How ‘bout you? A Full Moon often feels expansively emotional. This Full Moon will probably fit that description due to an intense conjoining of Mars with the Sun in Cancer and Pluto with the Moon in Capricorn. Mars and Pluto have a way of getting to the heart of the matter. It takes a bit of courage, but it is possible to see the root causes of fear and defensiveness. It is too easy to project onto others at this time. To truly transform, we may need to be with our own feelings for a while, asking ourselves: Why this? Why now? But be gentle with yourself as you listen. Mars, even in a softy sign like Cancer, can provoke heroic efforts. This muscular approach to emotion may only serve to shut down awareness of what is happening in our hearts. With Pluto involved threats seem very real, and perhaps they are. As the opposite sign in the zodiac, Capricorn is the balance and mirror for Cancer. If Cancer is the unconditional nurturer, Capricorn is the parent that holds us accountable. Both signs build a supportive structure for growth to happen. Capricorn’s structure is solid. Cancer’s is fluid. What is the balance point between a fluid state and a solid state? Too much earth and we risk cutting off the softening powers of emotion. Too much water and we risk dissolving completely. This Full Moon is a good time to notice where you need structure and where you need flow. Mars is action-oriented. In Cancer, Mars desires to connect, nurture, and protect. At the Full Moon, Mars is challenged by Saturn in Sagittarius to get it right. The quincunx aspect between these two planets gives a paradoxical twist to how we build our nurturing structures. Sagittarius desires freedom. This sign values truth more than comfort, one of Cancer’s desires. Integration is non-binary. Notice the pull in many directions as we absorb Mars’ and Saturn’s dialog. The best type of meaning to discover under this influence may be the value emotion gives to truth. It may be a few days before we settle into the truth of this Full Moon. I wonder what happens if we hold the intention of honoring interconnectedness as we encounter waves of emotion? How does that shift our experiences? Monday, July 10. It might feel like our minds are at odds with our emotions. It can be difficult to hold equal space for both. The Aquarius Moon is better at abstract thinking than it is at emotional sensitivity. You may notice a disconnect today if you were expecting intimate vulnerability and get a slew of ideas instead. The Moon first makes a trine to Venus in Gemini, stimulating ideas and social contact. Then, the Moon opposes Mercury in Leo. Hurt feelings could come from under-appreciation. Hurt feelings could lead to miscommunication. Even if you don’t want to, remember that empathy reinforces interconnection and interconnection helps everyone thrive. Tuesday, July 11. Constructive ideas and conversations are favored today. Don’t expect interactions to be very sensitive. It can feel like the more we stay in the realm of thought, the better. The Aquarius Moon likes that. The Moon makes a trine to Jupiter in another air sign, Libra, and then makes a sextile to Saturn in Sagittarius. Pay attention to the things that capture your imagination today. You can build on this fascination later. July 12—Disseminating Moon: Fruiting. We’ve had a chance to dry out the last couple of days. The Aquarius Moon encouraged stepping back from emotion to imagine how we are connected through our thoughts and ideals. With that perspective, what are you learning about emotion and interconnectedness this lunar cycle? This phase of the Moon supports harvesting the benefits we’ve gained from mindful intention and sharing them with others. 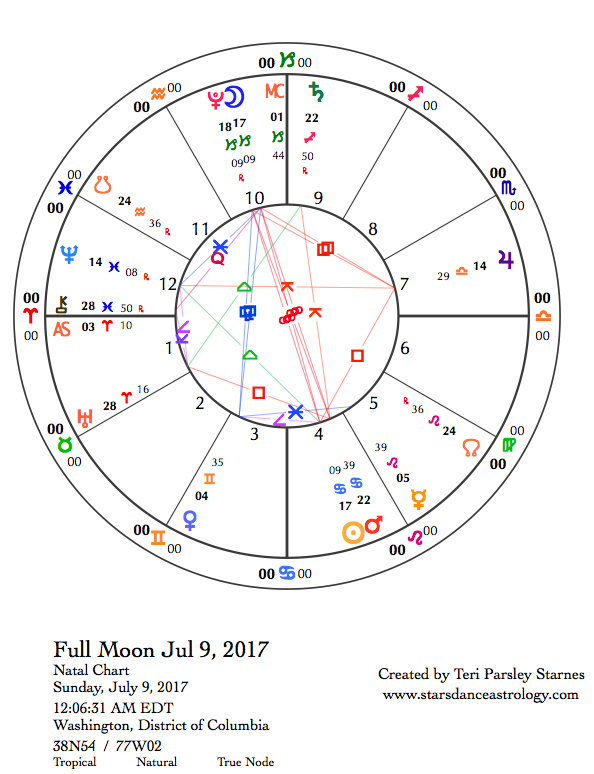 With the Moon moving into Pisces, a very fluid and sensitive water sign, we may want to extend that sharing impulse into service work. Don’t resist the impulse to expand through emotion into connection. Pisces influence makes this easy and provides the necessary insight for completion of this lunar cycle dedicated to emotional insight and learning. The only aspect today occurs in the morning before the Moon moves into Pisces: a sextile between the Moon in Aquarius and Uranus in Aries. Yes, indeed. Air gives us space to feel more. We are refreshed by energized thought. Time to move on. Thursday, July 13. A yod aspect pattern points us to the lessons of integration. 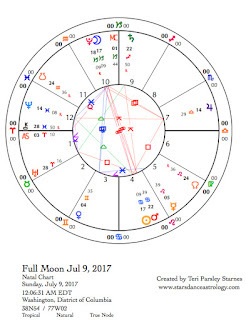 Jupiter in Libra makes a sextile to Mercury in Leo while both make a quincunx aspect to the conjunction of Moon and Neptune in Pisces. Yods must integrate planets in signs that are strange to each other, and so the prevailing tone is about integrating paradox. Our challenges push us to new understandings. The paradox here is about Piscean surrender, openness, and compassion in a world that is moving quickly, compartmentalizing people and ideas, and concerned with equity and justice. How do we cross boundaries into connection when our differences have never been more apparent? When under stress, Pisces influence can call up memories of trauma. Be gentle with yourself today and tomorrow. Even when we can’t see it, we are interconnected. Find your anchoring connection. Friday, July 14. Yesterday, I wrote about a yod aspect pattern that is in place right now. The Moon has moved off the pattern but the remaining planets are almost exact. Yods provoke breakthroughs when we integrate paradox and contrasts. Neptune in Pisces at the apex of the triangle represents what we need to integrate into the flowing connection between Jupiter in Libra and Mercury in Leo. Ideas, passion for creativity, and activism are strong. What may be missing and hard to find, is a greater connection to the whole. We may be asked to sacrifice a cherished idea in order to make our work larger. The potential to make an impact that reaches many hearts is great. But we might not succeed. Neptune also teaches through disappointments and loss. Another challenging transit puts on the pressure if we aren’t feeling effective. A quincunx aspect between The Sun in Cancer and Saturn in Sagittarius could feel discouraging. Watch out for piercing criticism. Notice how much you give yourself. Since we are all sensitive today, try to offer critique to others that accounts for these feelings that the stakes are high. Honor your ambitions and accept your imperfections. Saturday, July 15. The last few days have felt like a series of contrasting events and feelings. Perhaps you feel discouraged. Perhaps you feel confused. Notice emotion. With the Moon in Aries, the impulse may be to act forcefully to move away from these emotions. Anger may be a sign that you need to pay more attention. The challenge is to be still enough to notice what we are feeling. What does water teach you about your state of being right now? This Cancer lunar cycle still has plenty of lessons for us. Venus in Gemini and Mercury in Leo invite us to be creative about expressing deeper emotional experiences. We are asked to be alchemists blending air and fire with water. Earth influence is needed to complete the whole. Find your ground. Slow down. Honor emotion. Express yourself.